Some containers are simply too useful to throw away! I'm introducing you to my 9 favorite containers to reuse, and sharing tons of ideas for ways to repurpose them! When it comes to making eco-friendly choices in our lives, we’ve always heard that we should “reduce, reuse, and recycle!” But in my experience, especially back when I had all my kids at home, the “reduce” part of that maxim was the hardest to achieve. My kids were constantly threatening to eat us out of house and home (well, that may be a slight exaggeration), so cutting back wasn’t really an option when it came to certain types of containers. Bonus Tip: The lids on these Parmesan cheese shakers also fit perfectly on the tops of regular mouth mason jars! Baby wipes boxes are an extremely versatile container to have on hand. Personally, I use one to store my reusable fabric softener sheets. (Check out the link below to learn how to make them!) The baby wipes box keeps them nice and tidy, and I think the lid helps keep the fabric softener scent from dissipating too. The one drawback I’ve found with these containers is that their labels are more or less impossible to remove! The labels must be fused to the containers somehow, because I’ve had absolutely no luck trying to remove them. So if the label bothers you, your best bet is probably just to cover it up with a bit of cute scrapbook paper or washi tape! To remove the ink, just pour a little rubbing alcohol or nail polish remover onto a cotton ball and wipe the printed areas. You may need to use a few cotton balls to get all the ink off, but pretty soon you’ll have a clean container! Then wash it with soapy water and it’ll be ready to use. I find it virtually impossible to throw these versatile plastic buckets away! They’re really useful for corralling collections of items like seasonal cookies cutters and small toys. You can also fill them with soapy water when tackling cleaning jobs around the house. There are so many great uses for gum and mint containers. Gum containers are a bit bigger, so they’re great for storing craft supplies, snacks, or even loose change. And smaller mint containers are handy for corralling paper clips, emergency sewing supplies, or notoriously easy-to-lose hair accessories like bobby pins! The possibilities are practically endless. No decent list about repurposed containers could exclude the good old tin can! You can use one as a pencil holder, a small vase for flowers, a watering can for your houseplants, or you can make one of those two-cans-attached-with-string “telephones!” If you’ll have it out on a desk or table somewhere, you can make your tin can a bit more “fashionable” by covering it with washi tape or scrapbook paper. Place the cap on loosely and throw the milk jug in the freezer until it’s frozen solid. The milk jug “ice pack” is great for camping, picnics, and more! I often use one for trips to Costco, since the closest Costco to us is 30 minutes away. So I bring a cooler and my milk jug “ice pack” to keep the cold/frozen foods cold until we get back home! I love finding new uses for ordinary things you can find in any grocery store. :-) I found these stackable tackle box jars in the camping and fishing aisle quite by accident, and I just love them! They are great for storing small amounts of things in your purse or car, like ointment, pills, or lotion. Empty juice bottles are my container of choice for storing my homemade liquid laundry detergent. They’re the perfect size, and it’s nice to be able to reuse such a big container instead of just throwing it out. You can learn how to make my homemade liquid laundry detergent at the link below! What’s your favorite type of container to reuse, and what do you use it for? I used your parm cheese container idea! I had one of the smaller containers and I filled it with baking soda and some lemon, tea tree, and lavender EOs and let it sit until I needed it. Sure enough it came in handy when my dog peed on my carpet a few days later, then vomited on a rug. Now I always have scented baking soda ready for cleaning or deodorizing! I make an effort to keep & clean all types of containers that aren’t easily recycled, especially glass jars. One of my favorite plastic containers is the extra large liquid laundry detergent dispenser that has a spigot. I haven’t reused it yet, but it has too much potential to discard! Any suggestions? My parents buy liquid laundry detergent and I reuse their containers (spigot included) for my homemade laundry detergent. The quart yogurt container is perfect for dumping coffee grounds from a round or v-shaped coffee filter! Just turn the filter upside down on the container and tap both on the counter! Voila! The grounds are contained with little mess! One quart will hold over a week’s worth of coffee grounds which I then dump into my compost! The plain white container lives on the counter next to the coffee maker and coffee containers. 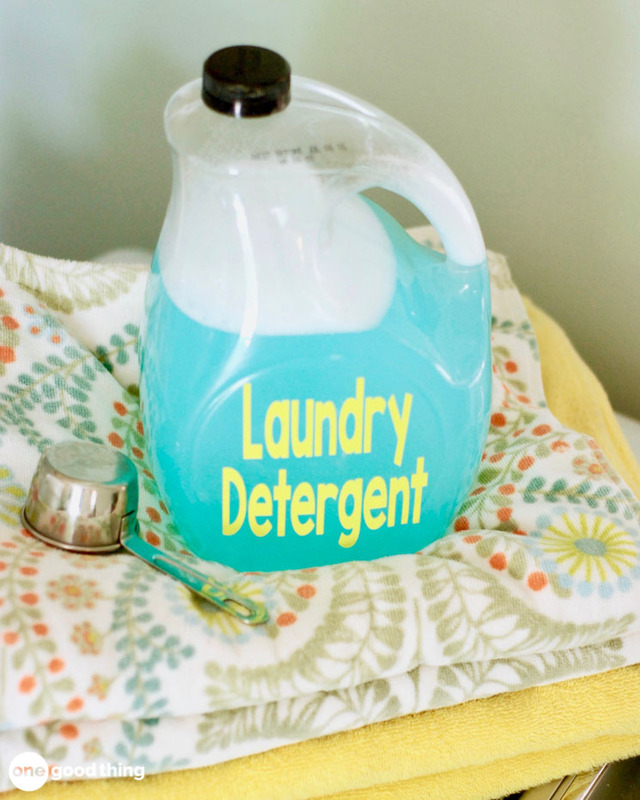 Loved your idea of making laundry detergent. Please help me figure out a way to repurpose unwanted sulfur based shampoo for hand or dish soap… right now I am just watering it down, but I wonder if I should add oil for hands and body wash. I would be grateful for any ideas. Jillie, are you from the south? We have been saving and repurposing plastic containers for years and get teased about it. I like to use the round mint containers for vitamins and pills when we go out to eat. Another great keeper is the square tissue box. It will hold at least 20 folded plastic grocery bags. It’s pretty and takes up very little space. Thank you for your daily tips! When sending cookies to rest stops for the senior center I found clean empty spinach , etc. plastic containers were perfect for packing cookies in and I didn’t worry about getting my containers back.